A single, very unusual family with Tourette syndrome (TS) has led Yale School of Medicine researchers to identify a rare mutation in a gene that is required to produce histamine. The finding provides a new framework to understand many years of data on the role of histamine function in the brain and points to a potentially novel approach to treatment of tics and Tourette. The study is published online May 5 in the New England Journal of Medicine by a team led by Matthew State, M.D., the Donald J. Cohen Associate Professor in the Yale Child Study Center and in the Departments of Psychiatry and Genetics, and co-director of the Yale Program on Neurogenetics. TS is a relatively common neurological disorder characterized by tics—involuntary, rapid, sudden movements or vocalizations that occur repeatedly in the same way. It affects as many as one of 100 school-age children. Tics begin in mid-childhood and peak at the start of adolescence. TS is not life threatening, but can be disabling. Affected children and adults commonly have other neuropsychiatric disorders including ADHD, obsessive-compulsive disorder or depression. Based on strong evidence that genes contribute to TS, the State lab has been searching for rare genetic mutations causing TS for over a decade, in the hopes of gaining a better understanding of the cause of the disorder, and finding opportunities to develop more effective treatments. "Rare families have been used in a variety of other common conditions to help identify underlying mechanisms of disease and find new approaches to treatment," said first author and Yale post-doctoral fellow Adife Gulhan Ercan-Sencicek. "We thought we could use the same approach in Tourette syndrome." State and his team found a family with TS with a rare mutation in a gene called 1-histidine de carboxylase (HDC). 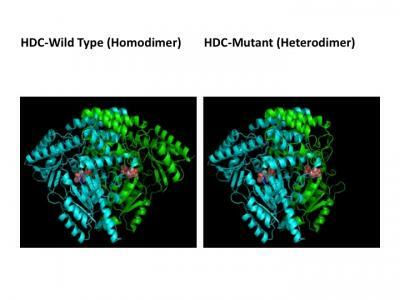 This gene makes a protein that is required for the production of histamine. Histamine is known more often for its role in allergic response, but it is an important neurotransmitter that influences a variety of brain functions. The father and all eight offspring were diagnosed with TS. The mother and her family did not have the disorder. Two children and the father also had obsessive-compulsive disorder. The State lab took DNA samples from all family members, found the one region of the genome that all affected individuals shared, and then identified a rare mutation in HDC within this region, which resulted in the mutated protein losing its function. State said past work on brain histamine by other labs shows that mice with low levels are more prone to repetitive behaviors that are similar to human tics, and that increasing brain histamine reverses this problem. "The opportunity to go directly from a rare genetic finding to a trial of a new approach to treatment in a neuropsychiatric disorder is very unusual," said State. "We were lucky to happen across a gene pointing to a well-studied area in neuroscience. There are several new medications in development that increase the release of brain histamine. Based on this genetic finding, these compounds would be good candidates for new treatments for Tourette."